While I don't really want to think about how much work it actually took to paint that floor, I am seeing some definite, cheap possibilities for radical change. Is this not the best idea ever for crapoflaging those hideous screenprinted tiles that seem to run rampant in otherwise nice homes? I am wondering how durable the finish would be, though. Does anyone have experience painting tile? Step one: find huge, cheap gold frames. Step two: paint your own shapes or cut up a big piece of fabric and frame. Step three: steal those lamps. heh. 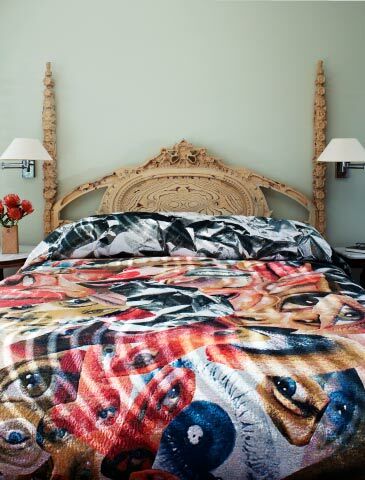 Sure it's a little voyeuristic, but at least you'll never be lonely in bed again. As I recall, this fabric was created with digital imaging and then sewn into a coverlet. There are so many digital service bureaus out there now that I'm sure there must be some reasonable options for printing your own fabric masterpieces. 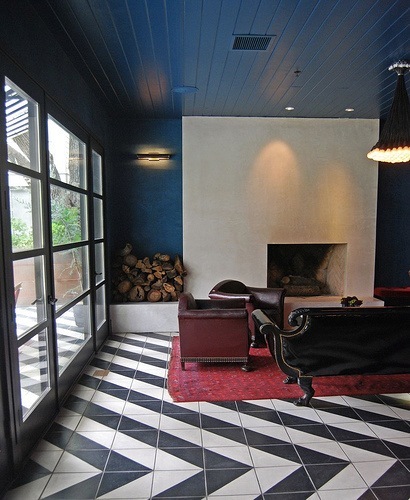 A couple of graphic touches can make a big impact in a neutral space. It would take three seconds to have those shapes cut out of MDF and paint them up all 80s Memphis like. The settee is a relatively easy upholstery job that could be done on the cheap with Ikea fabric, and y'all know I'm nothing if not hot for the cheap and easy. Dudes, I will be knocking this idea off someday. 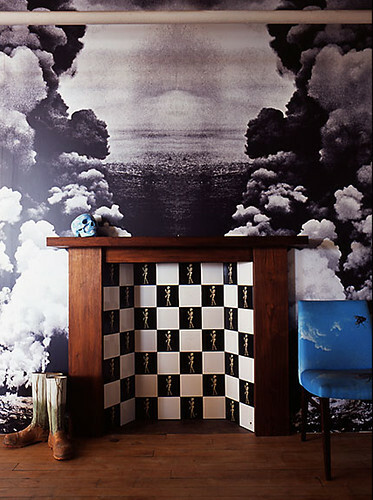 I can't afford Fornasetti's stunning Nuvole wall mural, but I can have my own images printed by Design Your Walls. 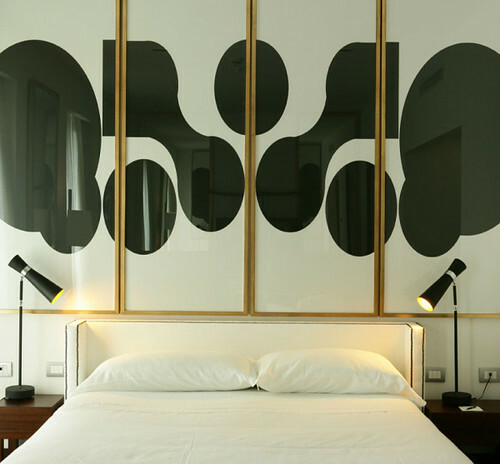 I actually flipped this image into a mirrored pattern much like the one above and then had it printed as wallpaper, which was really easy to do and relatively inexpensive. Think I might try some different images and see what I can come up with. You know... after I finish BBQing and swimming.